John is working at his office today so I am flying solo tonight for dinner. 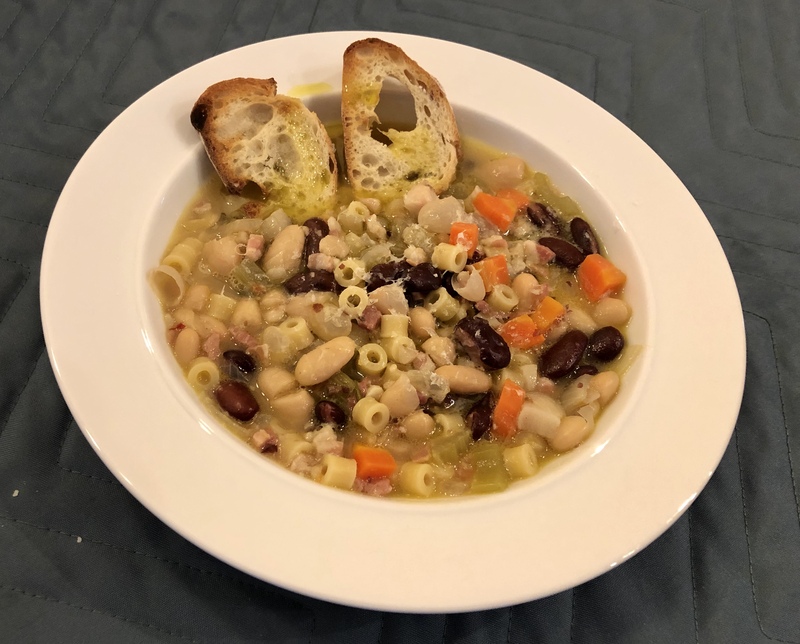 This pasta fagioli is based on a recipe by Giada De Laurentiis of Food Network fame. You can take a look at her recipe here. The changes I make are to add carrots and celery, use cannellini and kidney beans, sub out the chicken stock for half veg stock and half water, add Parmesan rinds to the stock, and sub in ditalini for macaroni. Although it is easy to make this soup vegetarian by leaving out the pancetta, the pancetta does give it an incredible depth of flavor. But if you do use the pancetta, do not use additional salt! This turns out so delicious!! Plus I have an additional portion of it to freeze or serve with tomorrow night’s purchased sandwiches! 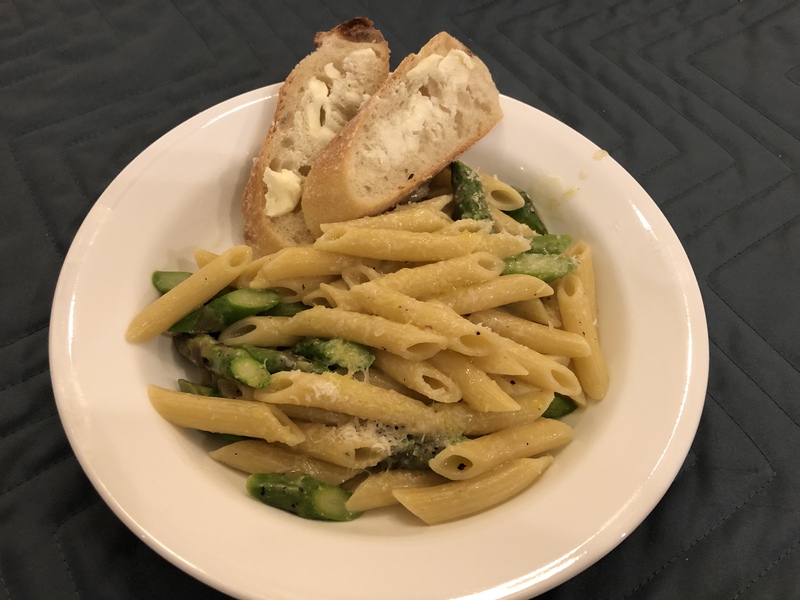 I cut the asparagus into the same shape as the penne and really only cook it while adding the penne, pasta water, pepper, and parmesan together to make a sauce. It turns out kind of like cacio e pepe except with penne instead of strands and asparagus. As I said we are keeping things pretty simple this week. 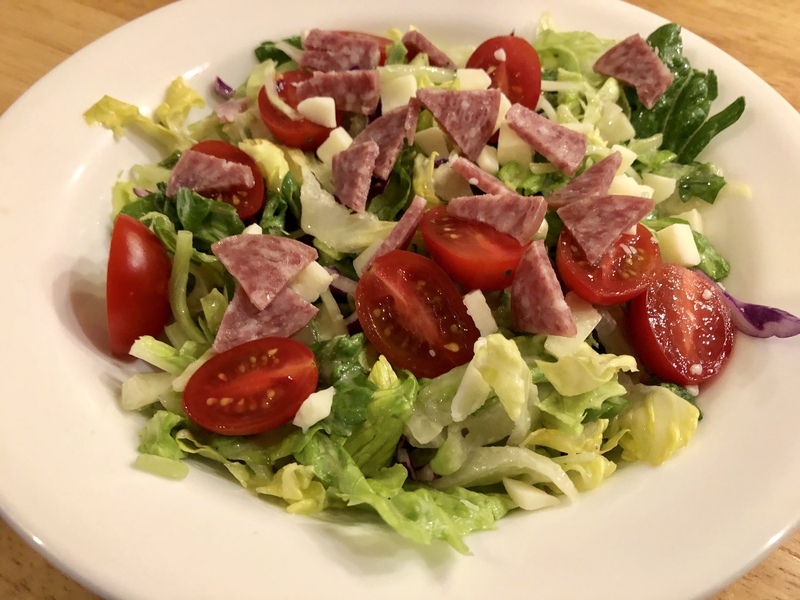 We start dinner off tonight with a bagged salad that I enhance with various toppings. The weather is lovely today so it is great for grilling. 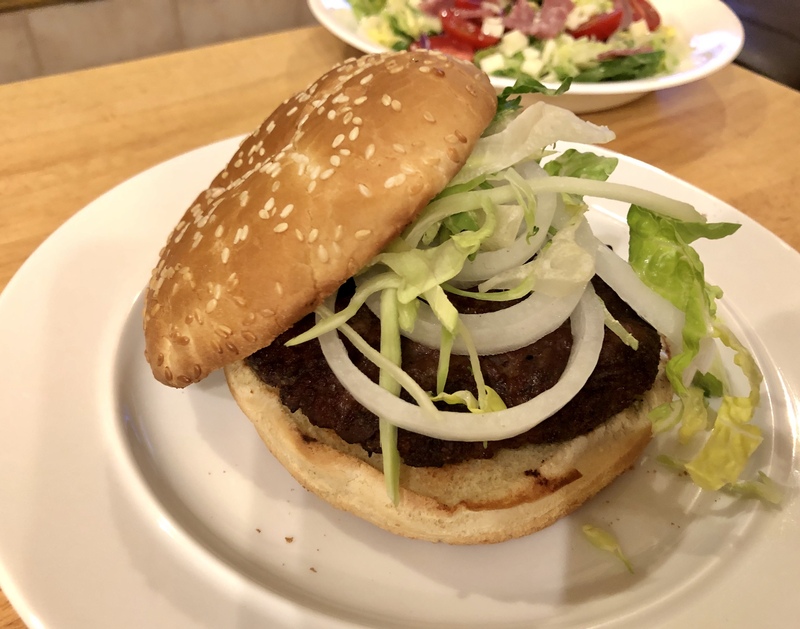 John cooks us each a burger and I add a bit of onion and lettuce to mine. This week is a short week for cooking since we are on vacation starting on Thursday. As usual I will be posting occasionally when we have something especially interesting or beautiful to eat. We did an excellent job with our menu this past week having prepared everything that we set out to do. Not only was it fun cooking from all around the world but the leftovers (which we mostly ate for lunches) were great too. This week’s short menu is very simple since we have a lot to do to get ready! After preparing dinners from all over the world this week, we come back to a humble chicken dinner to finish off the work week. John bakes the chicken thighs in the oven and then crisps the skin under the broiler. 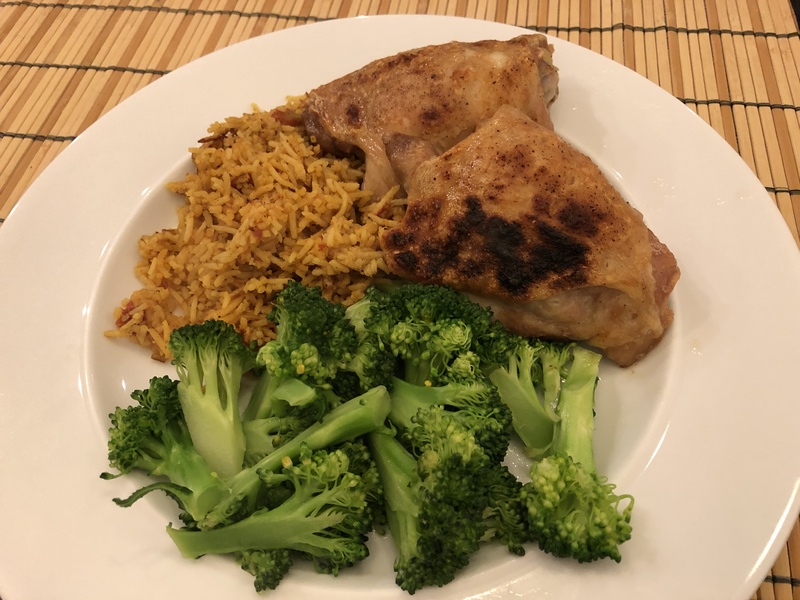 I reheat the rice from Thursday and steam some broccoli. We are child-watching Saturday night while our son and his wife go to a wedding. I am making Beeba’s much loved mac ‘n cheese (the blue box) for the kids and toting along some of our leftover lasagna for adult dinner. That being said, no new posts until Sunday or Monday when we will be having a short week since we are leaving on Thursday for vacation. Biryani is an Indian dish thought to have been brought to India by Arab traders and has an etymology stemming from the Persian word for rice. Since it is the first day of Spring, it is also Nowruz, a new year’s celebration which is observed by more than 300 million people from the Balkans to the Black Sea Basin to Central Asia to the Middle East. Plus the Indian Spring festival of Holi is also occurring. 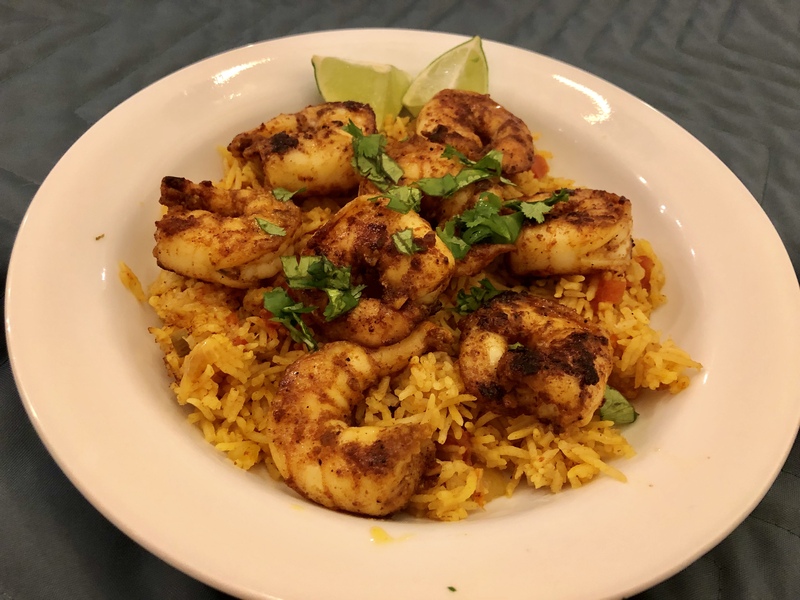 I am always looking for an inspiration to cook something and today’s shrimp biryani seems like a good way to celebrate Spring. John marinates the shrimp in the same spices I am using for the rice – ginger, chili powder, smoked paprika, turmeric, salt, and garlic. I am making the basmati rice in the Instant Pot using those spices plus a can of tomatoes, water, onions, and lime zest which is standing in for curry leaves today. When the rice is cooked, I add some lime juice to it and John quickly sautés the shrimp. Our Spring dinner is garnished with cilantro and lime wedges. When we were planning this week’s menu, John suggested we have a family favorite that we hadn’t had for quite a while. Hmm, Kenwood shrimp? Eggplant parmigiana? BBQ ribs? I suggest lasagna – end of discussion. Who does not love lasagna with its tangy sauce and creamy cheese? Plus it is a one pot dinner if you use the parboiled noodles. 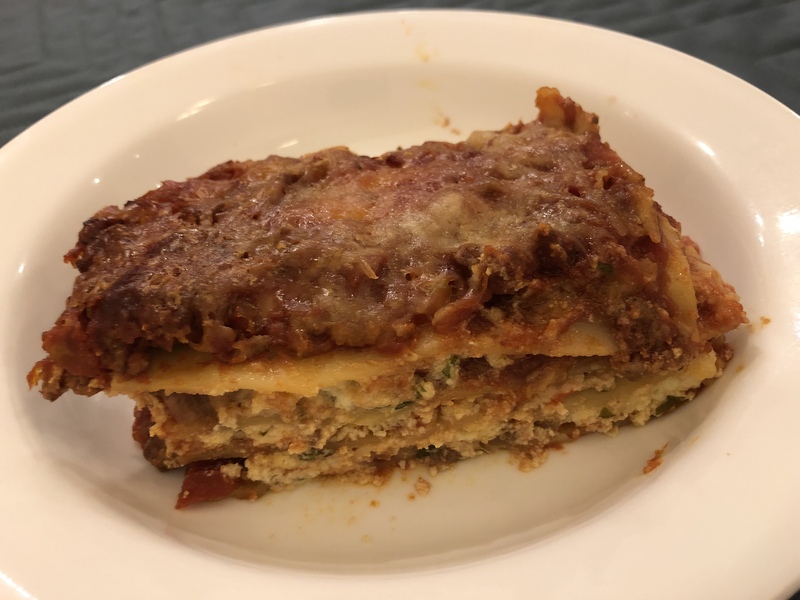 The last time we ate lasagna was for Christmas dinner in Florence. It is always a good time, special meal. I make the sauce in the morning and assemble the lasagna at dinner time. It is so good! 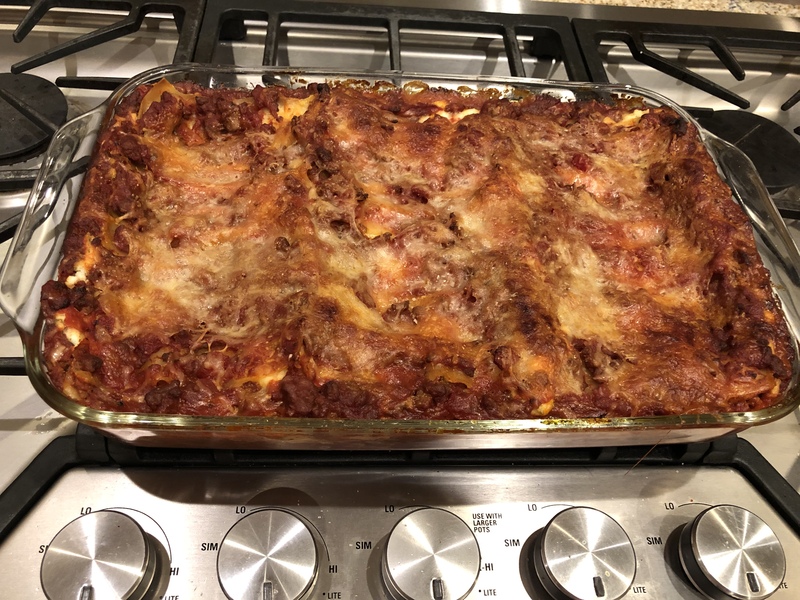 I bet you are thinking of making lasagna for yourself right now! !